All trekkers have their own story he or she loves to share. It is one huge indispensable part of the travel experience. 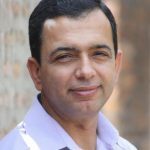 Before writing about my trekking experience on Khopra Ridge, I would like to state that I have been engaged in tourism industry as a guide and porter for 21 years and have been working for Nepal Sanctuary Treks for the last five years. I feel privilege to work with one of the reputed and sustainable trekking companies in Nepal. We have driven into the values of delivering quality services, safety and committed towards sustainability. The most likely of this company is personalized service and concerned about their staff and clients. Above and beyond, the company conducts various in-house and external training to staff that helps to sharpen the skills and enhance the knowledge. A few days of trek to Khopra ridge were filled up with excitement and enchanted by the natural charm. Khopra Ridge is one of the best short treks in Nepal. 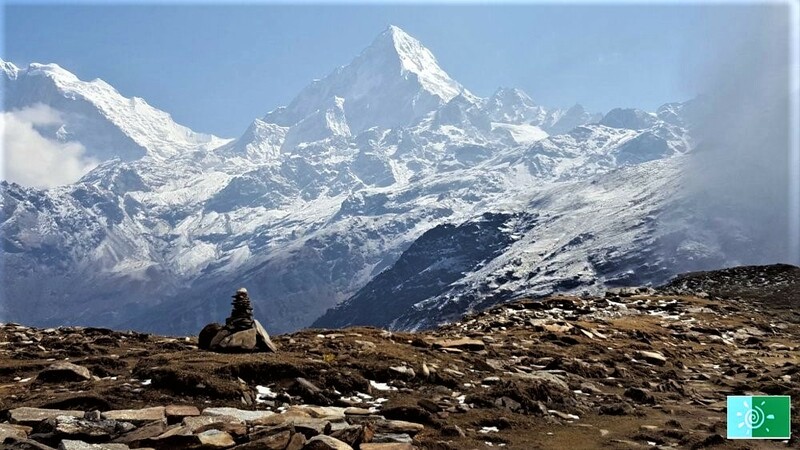 This trek comprises all the components of a classic Nepal trekking experience including hamlets, local culture wildlife, panoramic mountain views and range of landscape from forest to high alpine. Besides, the trail is dominated by blanketed forest of vibrant rhododendron, oak and pine trees. I feel that Khopra Ridge (3,660m/12,007ft.) 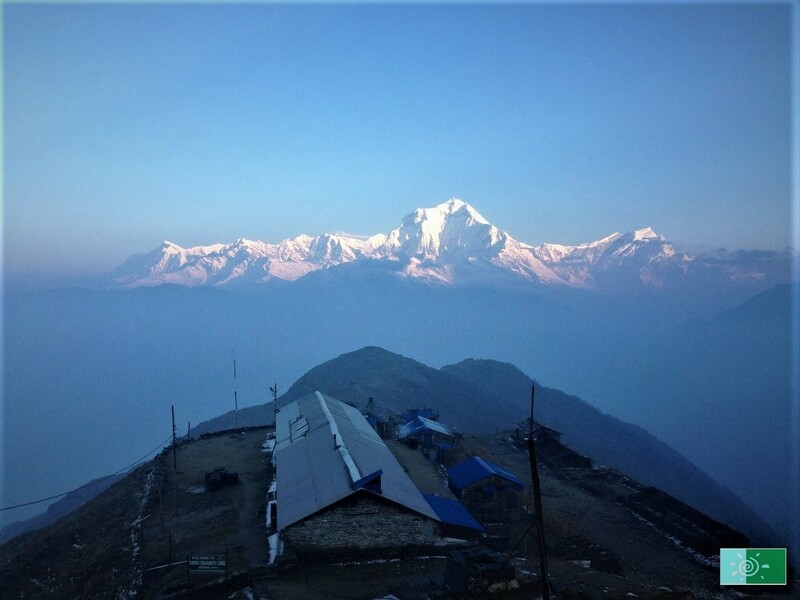 is a spectacular balcony from which to observe and experience the majestic and splendid views of mountain above 8,000m like Mount Dhaulagiri I-V (8,167m), Annapurna I (8,091m). 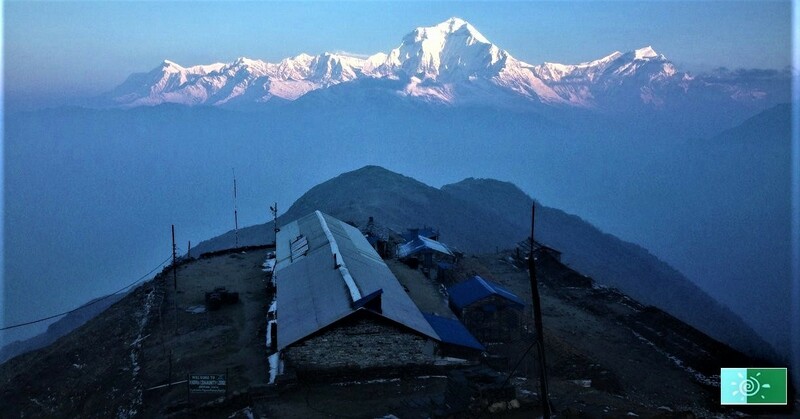 Apart from this one can take relish experiencing and observing Nilgiri range (7,061m), Bharha Shikhar (7,647m), Annapurna South (7,219m) , Gurja Peak, Dhampus peak and Tukuche that stand up in line blanketing in the everlasting snow. Khopra ridge can be ideal for any age groups normally from 10 up to 70. As far as you are physically fit, even beyond 70 can embark this adventure without any difficulties. Generally, this trek is quite moderate elevation and do not need technical or previous trekking experience. Even though it is a moderate trek however, with a good level of physical fitness, first time trekkers, families with no previous trekking experience can board on this incredible adventure. 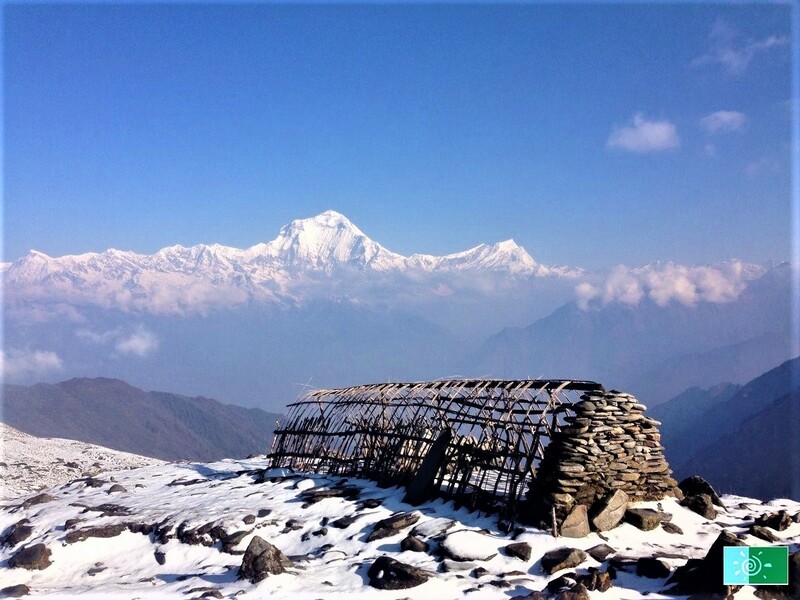 To trek Khopra ridge, one does not need to wait for special season i.e. spring, autumn. As it does not climb to a very high altitude and the more exposed parts of the trail get a lot of sunshine. The atmosphere is clear in comparison to other region. So, the trek is possible during most of the year. Khopra Ridge trek can be undertaken even in monsoon season. The only thing is one should be cautious of leeches and muddy trail. There is community lodges and private lodges operated and run by locals along the off the beaten trails. Whereas, there is only one community lodge in Khopra ridge. The lodging facilities and food are very basic. Despite of basic facilities, you can find fun-loving communities who are welcoming are the main essence of this trek. On 31 December 2018, our trekking crew and clients set off 10 days trek to Khopra ridge. We took an early morning short and spectacular flight to Pokhara. 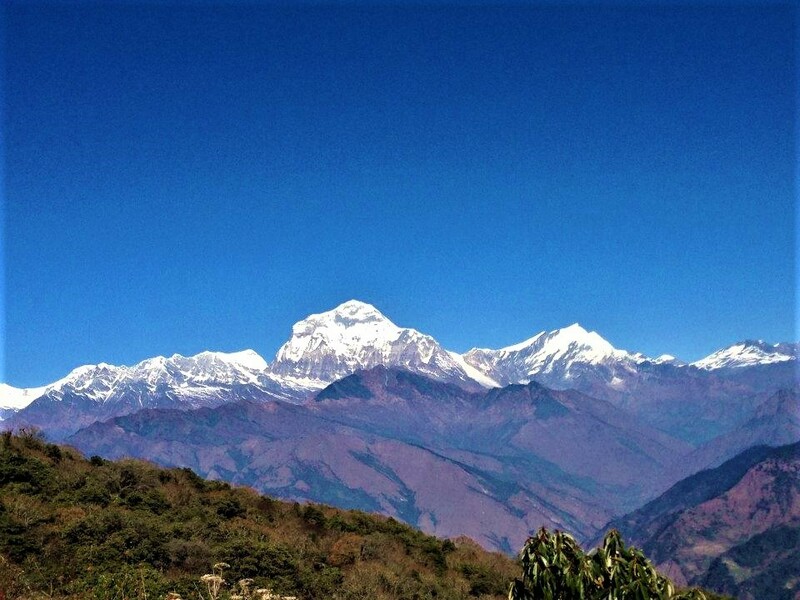 Our Khopra Ridge trekking begun from beautiful city Pokhara (820m) where we did 1.5 hours scenic drive to Lumle. 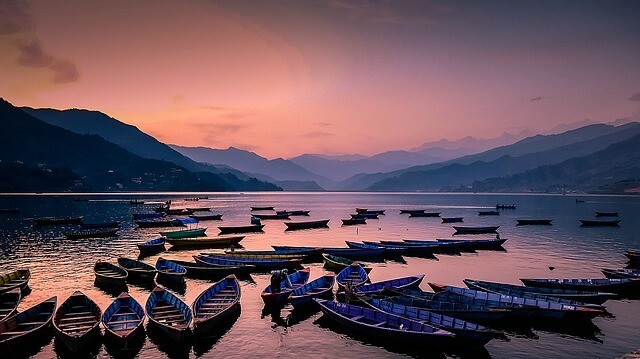 Alternatively, one can drive to Nayapul from Pokhara as well which is an old route. This time we chose to trek from Lumle from where we officially started our trek. 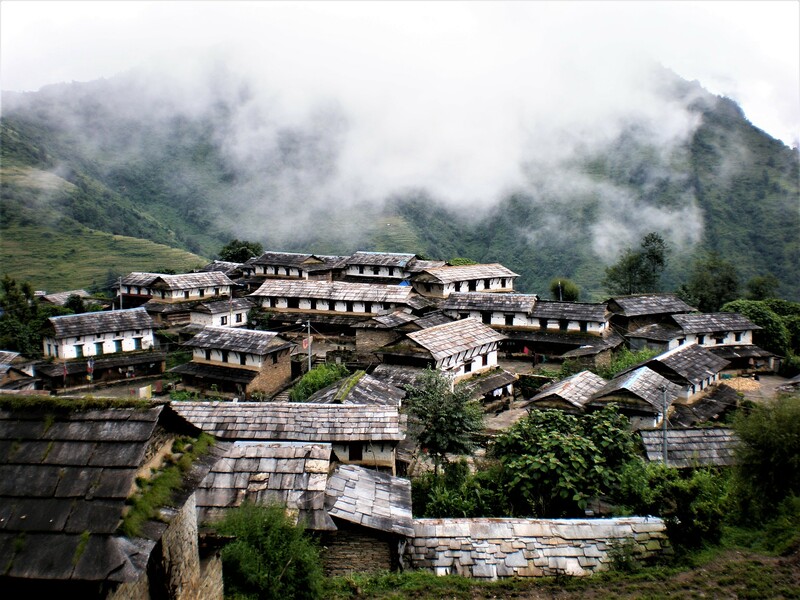 Lumle is a charming little town in the Kaski district. Once we reached Lumle (1,610m) we had a lunch and trek towards Seuli bazaar by passing Chandrakot. Chandrakot (1,580m) is a famous touristic area in the Annapurna region. We enjoyed the magnificent view of Annapurna range in Chandrakot. This village is dominated by the people of mixed community. After enjoying the beautiful himalayas we took descent through beautiful lush village all the way to Tomijung village. Further taking decent for an hour we reached at bank of Modi River and crossed suspension bridge. After walking through flat trails for 2 hours we finally reached at Seuli bazaar (1,170m) where we stayed overnight. Next day we had an early breakfast and took ascent trail. Following the motorway and crossing the road we took the main trekking trail to Ghandruk. After 3 hours of trek, we reached at picturesque Ghandruk village (1,970m), the settlement of 4000-5000 people mainly inhabited by Gurung community. We were greeted by the exquisite sight of clear snow-capped mountains like Fishtail, Hiunchuli, Gangapurna, and Annapurna south which are remarkably close.After lunch at Ghandruk, we visited Gurung Cultural museum, did village tour and observed the traditional houses which is still preserved by villagers. The countryside is incredibly picturesque and tranquil. On the way we came across with local people adorned with their traditional costumes. Trek to Ghandruk appealed us with rich Gurung culture and tradition of people living in this exotic place. On third day of our trek, we had our decent breakfast and leave commercial classic trek routes to follow the main trekking trail. Further, we took ascent and walked through beautiful blanketed forest of rhododendron trees enjoying the unspoiled nature and melodies of exotic birds. We continued our trek, walking and resting at teashops and having a masala tea. I must say, the pristine forest at the trail is splendidly beautiful. During our trek to Tandapani (2,590m), we saw innumerable episodes of flora and fauna like Himalaya bulbul, babbler, eagle and langur monkeys, which gave us imprint of being in a wonderland. After 45 minutes of trek from Bhaise Kharka through the middle of rhododendron forest, we arrived at Tandapani and rest overnight in private lodge. On fourth day of our trek, after an early breakfast at 7:30 am we continued to trek to Bayeli. We leave the main trail and started to trek towards less touristic trekking trail. Further, hiked to Bayeli Kharka (3,420m) through thick forest of rhododendron and oak tree. As we inclined, we had a pleasant walk through middle of the forest of shrouded pine trees. The area is a habitat to animals like panda, bear, pine marten, mongoose and many more. Our luck favored this time that we had a unique opportunity to observe the Pine Martens in close proximity. Along the trail, we spotted langur monkey playing in their clan and hanging on tree in its natural state which was truly charismatic. After 2.5 hours of trek we reached at Meshar where we found only one teahouse. The trekking hours was longer as compare to other days. From Meshar, we inclined for 1.5 hour to Isaru and had a tea break. Now the trail started to ascend above the tree line and follow a ridge to Dobato where we stopped for lunch and then continued to march towards Bayeli Kharka. The aesthetically attractive landscapes and pasture of the region made our trekking a heavenly affair. I experienced that in winter one will feel severe cold in Bayeli because this place is nestled above the tree line area. In spite of misty and foggy weather we enjoyed the view of Annapurna range from our lodge at Bayeli Kharka. On fifth day of our trek, we had breakfast at lodge and started by taking descent path through the shaded forest of rhododendron and pine trees. The trekking portion traversed handful of streams came down from the hill and froze in the winter to form a stretch of ice. The snow pile up on the ground where we walked up on snow dodging some difficult part. On this day it took us five hours to reach Chistibung (2,975m) whereas the normal hours to reach destination is only 3-4 hours. Once we got at Chistibung we had our lunch and overnight at community lodge. Next day of our trek lead us to our final destination Khopra ridge (3,640m). We took a gradual ascent through alpine meadows and pastures for three hours then as one approach Khopra Ridge, we saw the tip of Annapurna South and several other peaks. Upon reaching our destination which is the Khopra community lodge, we had our lunch. We were enthralled and mesmerized by the closer view of magnificent mountains and feel like, we would fly right then and touch the peak of the mountains. The surrounding from the ridge looked so magical, we couldn’t believe eyes as if we were viewing a real backdrop or some kind of HD Wallpaper. Whereas we could see the other side of the valley with dramatic and panoramic changeable layers of hills. If you are lucky enough you might encounter with bear, deer, Himalaya Tahr and lhophophorus, the national bird of Nepal. However, this time we came across with blood pheasant along the trail. On seventh day of our trek, we woke up early with the beautiful sunrise across the panorama of Himalayas. My mind and soul was actually enchanted when I witnessed the rising sun’s golden ray’s sweep through the silver mountains and transformed their colors from ivory to gold. After breakfast at lodge we hiked towards Khayer Lake (4,500m) to observe glaciers, lake and Mountain View. Khayer Lake offers a marvelous alpine experience and suitable to gain the altitude, observe the glacier and lake. Due to weather condition, we have to return back from the middle of the trail. However, we managed to reach at the altitude of 4,000 meter. We retraced back to community lodge to have our lunch. Afterwards, we descended down to Chistibung (2,975m) passing through meadow, oak and rhododendron forest and stayed overnight in Chistibung. Next day after breakfast we took descent all the way to Swanta village (2,200m). Swanta village is a settlement of Magar community. We witnessed spectacular beautiful terrace-farms ornament land and traditional houses with Mount Dhaulagiri backdrop. The rich and brimming rice plantation, several quaint sights of valleys and Himalayan foregrounds mesmerized any travelers. After 4 hours of trek we finally reached Swanta village. When we arrived our lodge, the snowflakes begun to fall, and we were very glad to be back. With a hot tea warming up our hands it was wonderful to watch the snow falling on the village from inside. After a night at Swanta village we ascended to Ghorepani and had lunch there. Further we took descended trail to Ulleri (1,309m) through rhododendron, alder and oak trees. Ulleri is a big settlement of Gurung community.We arrived our destination after a long 8 hours of trek . On the final day of our trek, we had our breakfast and took a descent of 4000-5000 stone stairs steps for two hours. Then we traversed the suspension bridge and reached at Tikhedhunga. Further, we walked flat trails passing the villages like Hille, Banjgara, Sudame. From Sudame we walked for 1 hour all the way to Birethathi where we checked out ACAP. After half an hour of walk we finally reached at end point of trek called Nayapul where we met our private transport and drove back to Pokhara. In a nutshell, I would highly recommend taking this trip as it is very suitable for visitors who truly wish to enjoy the wonderful unique vibrant culture and marvelous view of mountain with awe-inspiring landscape. Khopra ridge is a little part of heaven on earth which everyone should visit once in a lifetime. Want to explore less touristic trail and hidden gem of Annapurna region?